Five or six years ago, a somewhat feral, calico cat just showed up at Fred's house. Fred and his wife are a retired couple, and they developed a friendship with this cat over a long period of time. They cared for her, fed her, and eventually tamed her so well that they could pet her. They adopted her as one of their own and began keeping her inside at night. They named her Patches. Eventually they noticed that Patches was deaf. It appeared that she would respond to some very loud sounds, but it was not clear if she actually heard them or felt them. When Patches did not make her usual appearance one day, they began to look for her. They could hear her, but it took some time to actually locate her. 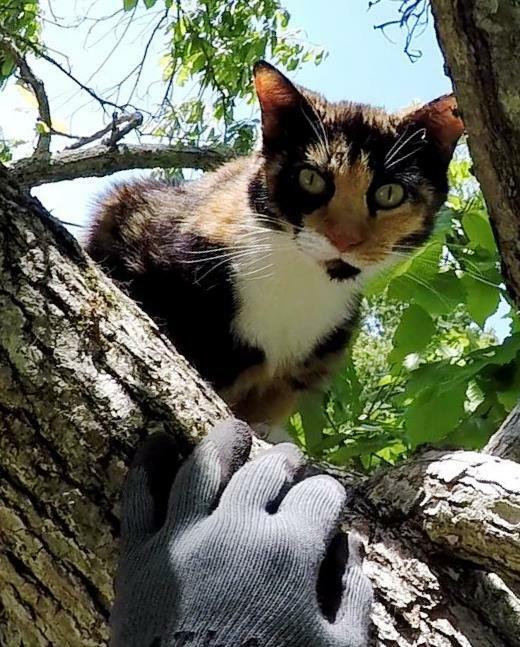 They found her 30 feet high in a tree near their driveway. They tried to coax her down, but nothing they tried worked. Patches was stuck. The next morning, they called Animal Control who referred them to me. 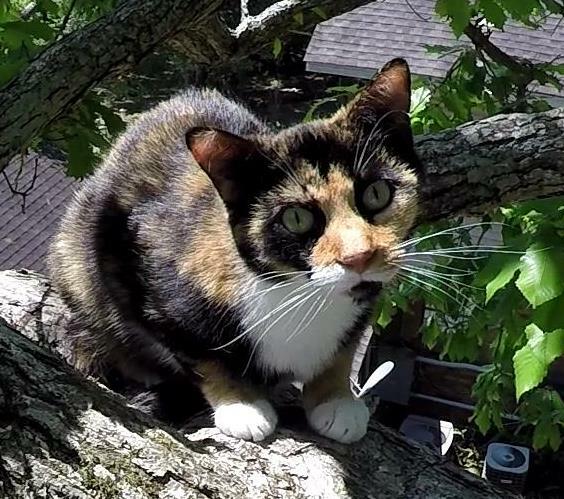 When I arrived, I found Patches quietly resting on a branch. She seemed to be napping. She was on the lowest branch of the tree, but it was a large tree, and there was plenty of tree above her to climb away from me if she became afraid. I was not sure what kind of reaction to expect from her, but I needed to be prepared for the worst. Fortunately, installing my line well above her did not frighten her at all, because she could not hear the commotion. When I climbed up toward her, I was pleased to see her watching me without alarm. She let me get within reach of her, and I extended my hand to her to let her sniff it. She sniffed it and remained calm and stayed in place. I went up a little higher and again we went through the same introduction. Judging by her reaction, I was feeling pretty confident that this would be an easy rescue. But when I pulled myself up higher to where I could stand on her branch, her demeanor changed. Seeing me looming so large above her must have frightened her, and she began to back away from me toward the end of the branch. I tried to coax her back to me, but she would not budge. I offered her food, but she refused to consider it. When I leaned far over to extend my hand to her again, she rebuffed me by backing even farther away. Now she was almost as far as she could go on that branch, and she perched there facing me I tried to use my extendable pole to gently rub her back end to get her to walk closer to me, but she would not budge from her position. I did not want to use the rescue pole on her, so I made one last attempt to reach out to touch her. I walked far out on the branch and was practically lying down on it to reach out as far as I could to her. She did not want me to touch her at first, but when I persisted, she relaxed and pushed her head into my hand. Now, I felt that I could bag her. I prepared my hand with the gloved bag and moved out just a little closer to get in a better position to scruff and bag her. When I felt like I had a good opportunity to scruff her, I did so and pulled the bag over her. She complained loudly, but did not fight me. I brought her down and gave her to Fred who graciously allowed me to go inside the house with him to release her. When she emerged from the bag, she had a lot of fussing to do, but once she realized that she was back on the ground and home and safe, she settled down and was ready to eat. Trust does not come easily to Patches, but once she does, she is a very sweet girl.